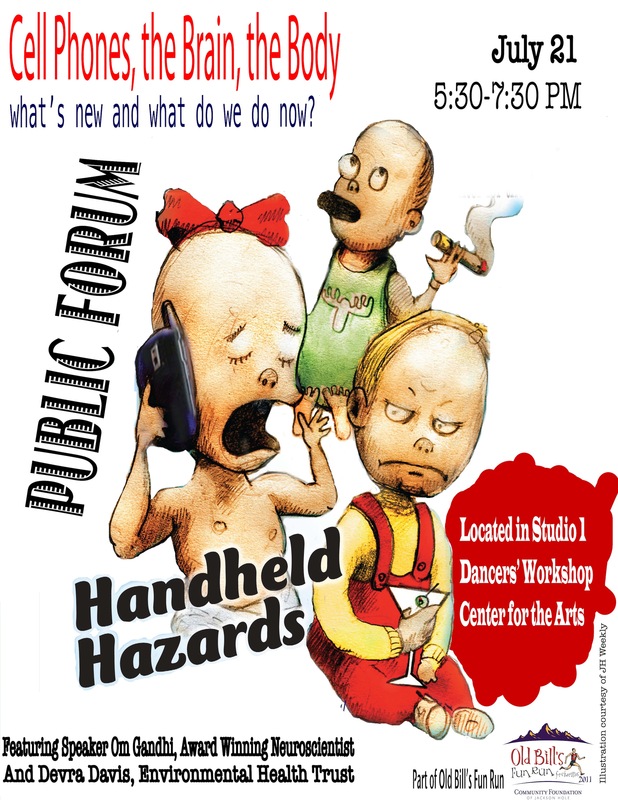 Cell Phones, The Brain, The Body – What’s New and What Do We Do Now? Featuring the latest scientific research on how cell phone radiation affects the child and adult brain and impacts of prenatal exposures. Click here for the Dancers’ Workshop Location. From 5:30pm-7:30pm on July 21st! Hope you can come! Appropriate treats will be provided. San Francisco, July 19, 2011 – With strong support from Environmental Health Trust and other public health experts, the San Francisco Board of Supervisors voted today 11-0 to improve and strengthen the nation’s first cell phone radiation law, in spite of legal intimidation and threats from the cell phone industry. Presenting the latest scientific research on how cell phone radiation affects the child and adult brain and the impacts of prenatal exposures. The St. John’s Medical Center designates this educational activity for a maximum of 2 credits AMA PRA Category 1 CreditsTM. Physicians should only claim credit commensurate with the extent of their participation in the activity. St. John’s Medical Center is accredited by the Colorado Medical Society to providecontinuing medical education for physicians. The Education Department of St. John’s Medical Center is an approved provider of continuing nursing education by CNE-Net, the education division of the NorthDakota Nurses Association, an accredited approver by the American Nurses Credentialing Center’s Commission on Accreditation. This activity will provide 2 contact hours. Successful Completion: Attendance at program and discussion with presenter. Do you Practice Safe Phone? Tell us why! Enter our video contest and you might just get your video featured on our websites & Facebook pages! The best video will be selected by EHT and will be announced via Facebook, Twitter, and will be featured in our weekly Newsletter. Head over to Reporter’s Roundtable blog on CNET to catch Dr. Davis. Stunning new findings from Research Teams at Biophysics in Gazi University, Ankara, confirm that prenatal exposures to pulsed digital signals from cellphones in rabbits and rats damage the brain, eyes, liver and skin of offspring. Detailed analyses of changes in different types of brain cells and structure after prenatal exposure to cellphone radiation were presented by Prof. Sulleyman Kaplan, Ondokuz Mayis University, Samsun, and biomarkers of genetic and other damage to cells and organs were provided by Prof. Nesrin Seyhan and her students and colleagues from Gazi University, Department of Physics. Prof. Annie Sasco, drawing on work of Profs. Elisabeth Cardis and Siegal Sadetzki, explained the limits of epidemiologic studies to date and noted that long-term regular cellphone use is linked with significantly elevated risk of gliomas, acoustic neuromas, and parotid gland tumors. The Interphone published results to date only have reported gliomas Note: On May 31, International Agency for Research on Cancer determined that radiofrequency radiation and electromagnetic fields are “possible” human carcinogens. The studies reviewed at this conference showed that levels of microwave radiation produced by cell phones in the real world today significantly damage and reduce sperm, impair DNA and memory, and cause deficits in offspring whose mothers are exposed during pregnancy. These new findings demand the attention of the Media and the action of the governments for the establishment of new biologically based guidelines, as has been proposed by well-known scientists in a recent publication. In any case, the precautionary principle should be followed. The major advice would be to use cell phones and other EMR sources at a safe distance. Go here to see the full workshop agenda. Catch Dr. Davis on Your Money with host Ali Velshi, airing on CNN this Saturday at 1PM EST and Sunday at 3PM EST. Dr. Devra Davis, author of Disconnect, stops by UW Radio to discuss the dangers of cell phone use. Despite its popularity, the use of cell phones has been shown to damage DNA, break down the brain’s defenses, and reduce sperm count while increasing memory loss, the risk of Alzheimer’s disease, and even cancer. To add a reminder or listen live at 8PM EST go HERE.